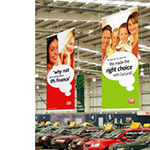 We print your photos and artwork onto PVC Banners finished in a variety of ways to suit every application. 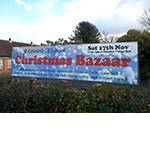 You can order just one printed banner if that is all you need, but we can print PVC vinyl banners in large numbers if required, and we bulk discount anything greater than one, even if each banner print is different, and all different sizes. 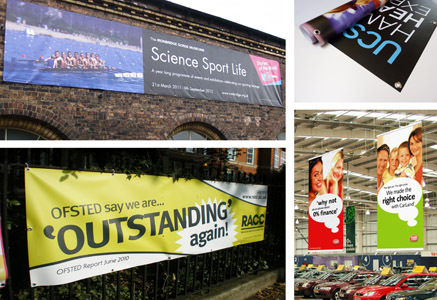 Banner printing can be single or double sided, either way, the quality is outstanding which is why Supersize Print are the number one online large banner printing service. The perfect banner for most common uses outdoor as well as indoor. The PVC (vinyl) material is a substantial 550gsm containing a nylon reinforcing mesh. Eyelets every 2 foot around all edges and in each corner for fixing by a variety of methods including rope, bungee, cable ties, screws with washers or hooks. Ideal for all indoor uses and short term outdoor events where budget is key. 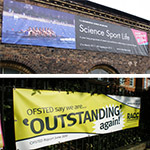 The banner is printed at the same high quality as our other premium banners on to a slightly lighter reinforced PVC material.